Alyssa was lucky enough to spend her college program working in one of my favorite resorts in Walt Disney World. Here's what she had to say about her experience in housekeeping at the Wilderness Lodge! I participated in the Spring Advantage 2011 Disney College Program. I was a housekeeper at Wilderness Lodge. Wilderness Lodge was very home like to me because I grew up in South Jersey surrounded by woods and I love the outdoors. A typical work day for me started at 8:00 am to 4:30 pm. One awesome fact about housekeeping is that once you hit 90 days working, you get to leave at 3:45pm (if your rooms are cleaned and checked by a manager!) On a regular day, housekeepers are given a board (just a piece of paper) with a maximum of 16 rooms to clean . The rooms are categorized by linen change (every 5th day of stay), check-out, and occupied. The occupied rooms were the easiest because it was a basic clean and check-outs were the hardiest. Besides cleaning rooms, I was also trained in the telephone room. This job contained answering phone calls from guests, managers, and other housekeepers. It was also connected to Fort Wilderness Resort so my co-workers and I got calls from both resorts. The phone room is always busy. The housekeepers would call the phone room if they needed something in the room that they were cleaning and the same for the guests. It was also another way for a guest or housekeeper to get ahold of the managers. Another role I was trained in was custodial. Sometimes I would help out the custodial team in the public areas in and area the resort. The cool part about the custodial role was that sometimes I got to ride around in a golf cart all day going from Wilderness Lodge to Fort Wilderness. Yes. Housekeeping was the first role I chose. I was definitely happy about it because I enjoy cleaning. I was brought up in a household cleaning all the time. To some people it may sound funny, but cleaning helps relieve my stress. It was very difficult at times since it is Disney World and guests expect nothing but the best. It is hard work, but the managers make sure you are getting help if you need it. There were only a few College Program girls in housekeeping so we were able to get to know our managers on a personal level. It was fun going to work knowing how appreciated you are. The best week was housekeeping week. We played games, got prizes, and even food... for free! Sometimes the managers would make us breakfast! My favorite parts about housekeeping would have to be getting to know the different managers and housekeepers. Every single morning I would clock into work and every was smiling and saying 'Good Morning'. It was very different where I am from. The other college program girls I worked with were just as fun and outgoing as me so we got along pretty well. Everyone knows that Florida is very hot and humid in the summertime. I was lucky enough to get placed at Wilderness Lodge where it was inside and air conditioned. It is also the prettiest resort to look at. A least favorite thing about housekeeping would HAVE to be being away from home during the holidays for the first time. I was definitely feeling sad around Thanksgiving and Christmas, but 90% of people in the program are in the same boat. Don't think that you're the only one missing home during holidays. A magical moment for me was when myself and five other friends were walking around in Animal Kingdom and got selected to ride on Mickey's Jammin' Jungle Parade. Everyday guest service cast members select guests to be a part of the magic and ride in the parade. We were on Mickey Mouse's float and if you know me Mickey Mouse is my all time favorite Disney character. I cried for days and told all my friends back home how famous I was for being in guests memories of that day's parade. I waved to everyone like I was in the Miss United States pageant. I couldn't have asked for a better day! Alyssa and friends in Mickey's Jammin' Jungle Parade! One of my professors at Community College told my class about the Disney College Program. I've never heard of it before she announced it to the class. She said that her daughter did the program and fell in love with the company. I figured why not? Even though housekeeping had nothing to do with my major (Education). It was for me all about the experience of being away from home for the first time. I never went away to college so I never got to experience being on my own. Also, networking is definitely a reason I wanted to do the program. The people I met through this experience shaped me into the person I am today. I wish I would have known more about the Disney classes you can take during the program. I definitely should have looked into doing so before I started my experience. I feel like I would have learned so much more about the company historically. To the future CP housekeepers: network, network, network! Meeting new people from all over the world will allow you to travel and make friendships that last a lifetime. Work hard, play hard (not too hard though). I worked a lot during busy times; the whole month of a June I had off three days. Working holidays and weekends are a must. My two days off were usually Monday and Tuesday. 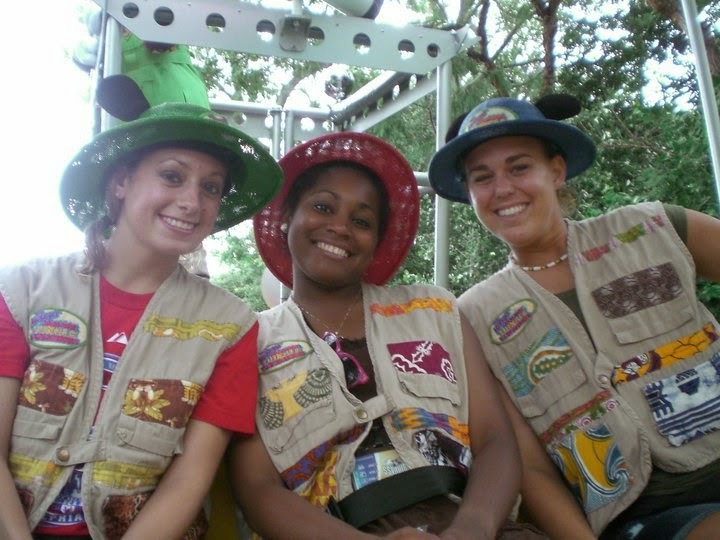 Also, Disney VoluntEARS is another great way to network and get to know different parts of the company. I would advice people who are interested in the program to follow the rules! Disney is a well-rounded atmosphere and has many strict rules. If you are a rule breaker, this may not be the best internship for you. Other than that, the Disney College Program Internship is the best thing that has ever happened to me. After my program, I became a Campus Representative at my University. I was still a cast member, but in order to get my maingates (passes to the parks), I had to go to Orlando and work at least one shift. I have several friends that stayed in Orlando after the program so I made my work trip into a vacation. I went down every January and stayed with a friend for about five days (worked one day) and played the rest of the days. However, Disney no longer has the campus rep program anymore. I graduate in two weeks from college and plan to work for the Walt Disney Company in the near future. Disney created a whole new life for me and I can't wait to start a career (hopefully) with the greatest company of all time! Ever wonder what it's like to work at the popular and thrilling Expedition Everest in Animal Kingdom? Olivia was kind enough to share with us her experience during her college program! My role was attractions, and I worked at Expedition Everest in Animal Kingdom. I extended my program and remained in the same role and work location as well. So I worked there for a total of 8 months (April to January). Typical days were 6 or 8 hours total. I would be put into rotation (you basically move to a different position every 45 minutes) and I would have a couple 15 minute breaks and maybe a 30 minute lunch. The positions were varied. Some included greeting guests outside, answering their questions and checking heights of kids. There were also load and unload positions, where you send the train and check people's lap bars, or at unload you would direct people to the exit and check each seat for lost and found. The best role was “Tower”, where you watch the trains on several monitors and make sure everything was safe. Why it was the best was for one simple thing: air conditioning! The entire ride is outside so most positions you are standing outside in the heat. “Tower” was a nice little break where you get to sit in an air conditioned room. I also enjoyed “Load” and “Grouper”. These are the positions that you help direct people to their rows to get on the next train. These were probably the most stressful since you have to fill a train with 34 people under 53 seconds, and the load area is very loud and people are very excited to get on the ride and don't exactly listen. But you get used to it and the positions actually become a bit of a game which is fun! And as a CP, you are guaranteed to be a closer. If the leaders are in a good mood you get to do a ride-through once you close the ride for guests. 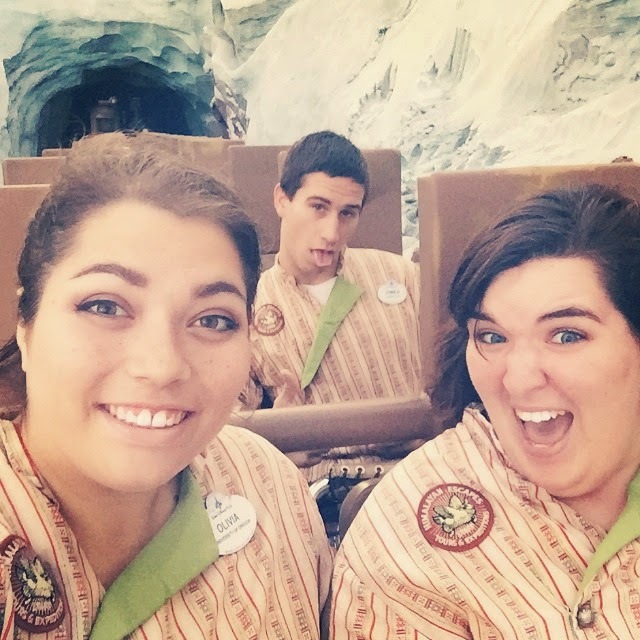 I have so many silly ride pictures with my coworkers from those ride-throughs! But being a closer means you also have to walk up the mountain and check that the track is clear and for any lost and found. There's no elevator, so yes you walk all the way up to the top! In case you're wondering, there are 17 flights of stairs. But there's a fantastic view of Disney World, and you get to see Betty up close (that's the unofficial name cast members gave to the Yeti). At Everest, you definitely are going to be losing weight! I always wanted attractions, and I always wanted to work at Haunted Mansion or Tower of Terror. But those are obviously really popular and I knew there was a slim chance I would get those. I remember thinking, “I'm fine with working at any park except Animal Kingdom” and then come check-in day of course I got that park! But I am so incredibly happy I got Everest. It was a stressful, and sometimes monotonous job, but I made such amazing friends there. It was incredibly worth it. If you get Everest, prepare yourself for working with some amazing and hilarious people. The Everest break room is legendary! Don't be surprised to walk in there and see one person turning the lights on and off and everyone else starting a twerking dance party. But you become a family. Once a Sherpa, always a Sherpa! My least favorite part was some aspects of the job. 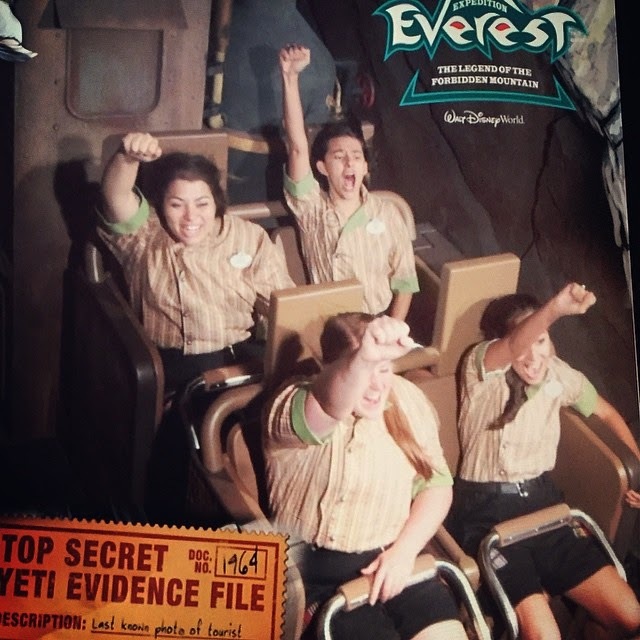 Everest is known for being the best at getting guests on the ride as quickly and efficiently as possible. So out of the four keys, besides safety, efficiency is pushed more than anything else. Unless you're out at the entrance greeting guests, you don't really get to practice courtesy. That's something I really wanted to do more often, making magic for guests. There are two. One morning I was opening which was rare, and I was feeling awful for personal reasons. These two guests were waiting for the ride to open, and I got to have a wonderful conversation. They talked about where they were from (Georgia) and we got to discuss everything we loved about Disney. It was a nice way to start work. A few days later I got a fanatic card from a leader, and found out the two ladies I talked to went to guest relations to write a compliment about me. I never expected such a nice thing on what I thought would be a terrible day! Another moment happened during an event shift. Companies and people can rent out Everest after hours for parties or conventions, so sometimes I was scheduled for those extra events. One time a family had an event there for the 4th of July weekend. They got to have the Asia area decorated with candles and prayer flags and there was music, food, drinks, dancers and even actors playing the characters in the Everest storyline (there was a Bob and Norbu, if anyone knows that reference! ), there were people on stilts dressed up as yetis. And there was a Bollywood dance mob! The best part was they had a projection of the yeti moving around the outside of the mountain. It was so amazing, and you could hear the yeti roar. 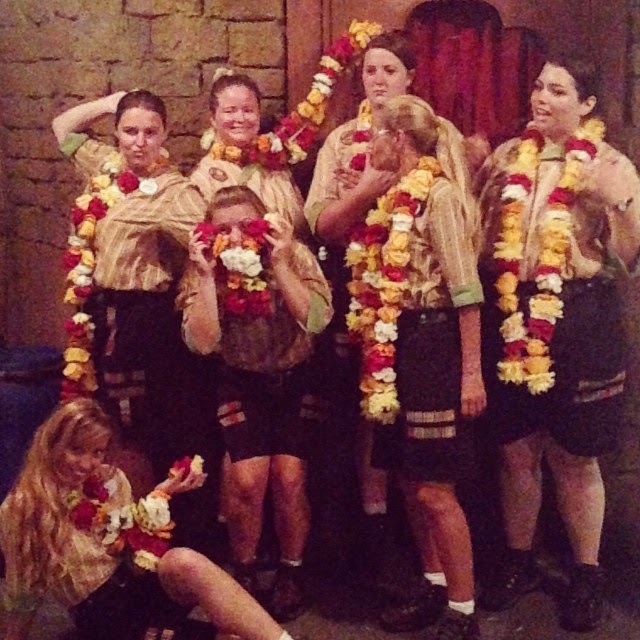 The cast members working got to witness everything (There's a photo of us that night wearing these beautiful flower leis that were given to us) It was so beautiful and magical and I wish everyone could experience Everest and Asia that way! I am studying film, and I absolutely adore the Disney parks and films, so it's my dream to work for Disney Animation or Pixar. I thought it would be a great way to open the door a bit into the company. There is also a part of me that just really wanted to work in a Disney park. That was the kind of thing I dreamed about doing as a little kid, so it was very cool being able to make that childhood dream come true. I am pursuing the professional internships right now, I definitely see Disney as a home! I always read that the Transtar buses were awful, but because I live in Oregon I felt it would be easier to just use those then drive all the way to Florida. And I thought the transportation system here at my school was bad. But I was very wrong. If you have a car, TAKE IT. It is so much easier to have a car and not worry about the bus schedules, which usually don't matter because the bus is late. I was late for work a couple times because of Transtar, thankfully my leaders were understanding and I didn't get any points. And if you want to go to Universal or anywhere outside of Disney, you have to depend on someone with a car. It really is a hassle. If there is no way you can bring a car, Transtar does its job of taking you to work and back and to go to the parks on your days off, but not much else. So make friends with people that have cars! Also, stop worrying about making friends. It is going to happen, and they are going to become some of your closest friends. Seriously, stop worrying! You have to be creative. With attractions, especially popular ones like Everest, safety and efficiency will be more important than courtesy. And we all really want to create magical moments every day at work, but it can be hard when you're in attractions. So you have to be creative! When I was at a console at load (where you send the train), a friend and I would tell the whole train that we would not send it until everyone put their “yeti paws” up and roar. Kids and, surprisingly, teenagers loved this. Instead of the usual magical moments that we cannot participate in, we made up our own. And Everest has a really rich back story, so it was fun to talk to guests about our travel company Himalayan Escapes and that there was no need to worry about yetis, it was just local folklore and that our trains are totally safe ;) So my advice: think a bit outside the box so you can create those magical moments! Take advantage of everything! The housing events (FREE FOOD), the trips that they set up (I went to a trampoline park with my roommates one time), as well as the classes. And I think everyone that does the DCP wants to continue working for Disney, and my advice for that: network like crazy, and stay in school. Managers, leaders, coordinators, they are all there. But you have to seek out communication with them, let them know you want to continue working at Disney. If you see a manager, ask how their day is going, see if they need any help. Just make your presence known with them and set up meetings to discuss your resume, find out if they know anyone that is in your field and that you can contact for future jobs or internships. Seriously, managers know a lot of people. And if they like you, they will help you! Also, getting to work in Disney World and going to the parks for free- it can be addicting! I know a lot of people that stopped going to school and just moved down to Orlando and got a full-time or part-time frontline job at Disney. But it is so difficult to move up in these jobs. I got great advice from an area manager at my work: Disney will always be here. There will always be jobs available. So after your DCP ends, go back and finish school, get your degree, and then come back. And if you have already graduated, find a job that utilizes your degree, get a year or two of work experience there. Keep in contact with leaders, check in with how they are doing, and tell them how you're progressing. With a degree and more work experience, you will have so many more opportunities to work for Disney, ones that pay better and utilize your skills much better, rather than just those full-time and part-time roles in the parks which can get monotonous. I know how hard it is to stay away though, I'm currently living it! So appreciate every moment you get during your DCP. Collect keepsakes, photos and memories, stay in contact with the friends you made. Use those wonderful memories to help push you to work harder, get better grades, be more professional, so when you do go back to Disney, not only do you get to go to the parks again, but you get to work at your dream job! When I visited home a few weeks ago, I found an example graduation announcement (pictured left) in my junk mail. When I opened the envelope and saw this fake Santa Clara University card, I couldn't help but laugh. Four years ago I was applying for colleges and preparing to graduate high school. Some of my friends weren't exactly sure where they wanted to go or what they wanted to do. I was one of the few who had her mind set: I wanted to attend Santa Clara University to pursue a degree in psychology and a minor in creative writing. I toured SCU earlier in the year and absolutely fell in love. I received acceptances from all the colleges and universities I applied to (except Stanford which was no shocker), but the day I received the giant envelope from SCU I literally screamed and barely fought away tears. I knew my dreams were starting to come true. Flash forward a couple of months and a few friends of mine were accepting offers and posting their excitement for their new future schools on Facebook. Meanwhile, I hadn't accepted SCU's offer yet. Finances were an important factor...SCU is a private school. Saint Mary's University (another private school) had offered me a huge scholarship to pay for half of my tuition and attend their honors program, so I had high hopes that SCU would do the same. Finally, the moment of truth arrived. I received the email from SCU with the subject "Financial Aid." This was it. This was the moment of truth. I took a deep breath and opened the email. My heart sank. All they offered me was loans. I was so upset. I knew that the reality of the situation required me to think of other options; I simply couldn't afford to go to SCU. I was crushed. I was so hopeful and confident in my plans...I didn't expect anything to go awry. I had no idea what to do. Remembering what I was feeling when my clear vision became a complete and total blur reminds me of some messages I've been receiving from people about not getting accepted into the Disney College Program. I may have gotten accepted into the DCP when I applied, but this never would have happened if I hadn't gotten the disruption from not going to my dream school. I've received messages confessing, "The DCP was my dream. I'm completely crushed. It's all I wanted to do. I have no idea what to do now." When I read messages like this I respond in a way that reflects what happened with me. This was the moment that I realized that everything seriously happens for a reason. When one door closes, another one opens. Add any other cliche mottos/sayings you may have about challenges and opportunities, and they're all true. The door to SCU shutting in my face opened up a chain of events that I never imagined would be possible. I decided to go to my community college near home, changed my major, finished early, and participated in the Disney College Program. I found the DCP because I knew I was finishing early and wanted to take that opportunity. I might not have even found the DCP if I went to SCU like I had originally planned. I had doors closed during my DCP: I didn't get the role I wanted, I didn't get the apartment I wanted, nor did I work in a park like I was planning on doing. I wanted to work in attractions or merchandise at Hollywood Studios and live in Chatham Square. Instead, I worked in foods at the Polynesian Resort and lived in Patterson Court. I grew to love what I did and where I lived, and learned a lot about myself in the process. After the DCP, I took another chance and did something I never thought I would do: move to Southern California. I transferred schools to a completely foreign city, far away from my family. Also, during my DCP my plan of becoming a campus rep was denied (another door closed), but this was great because if I had gotten that job, I would have never applied or gotten hired at Disneyland and meet all my amazing friends I consider my second family and have this incredible job. Looking back, this dream was accomplished because another dream was crushed. Receiving this fake graduation invitation the other day reminded me that if I had attended SCU like I had planned, my life would be completely different from what it is today. If you're rejected or denied from the DCP, an internship, a school, or any opportunity you might have your heart on, just keep in mind that there's a reason behind every action and every moment. This may have been the dream you wanted, but there's another dream out there just waiting for you to discover and accomplish. You can do it, I believe in you. It may be a rough path, but it's all completely worth it in the end.